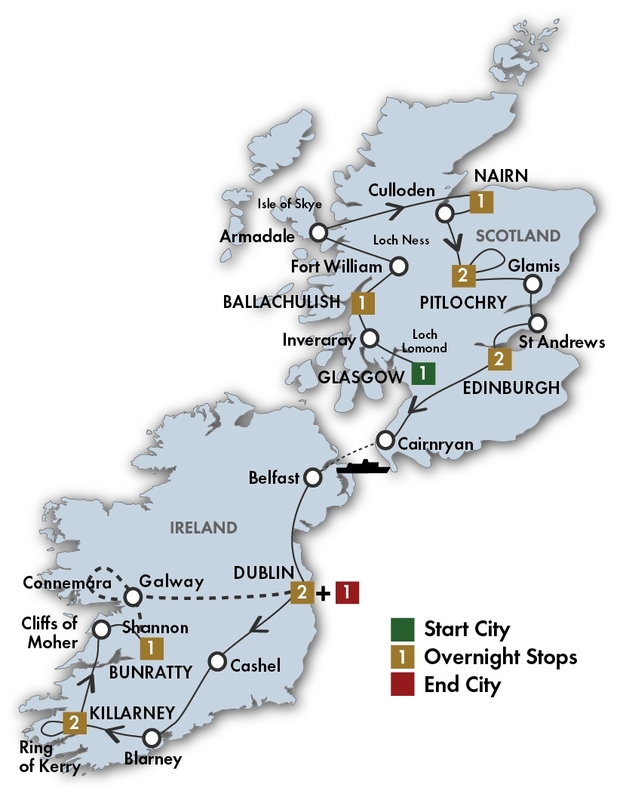 Fully Inclusive Vacations • Enjoy Ireland & Scotland at their best! 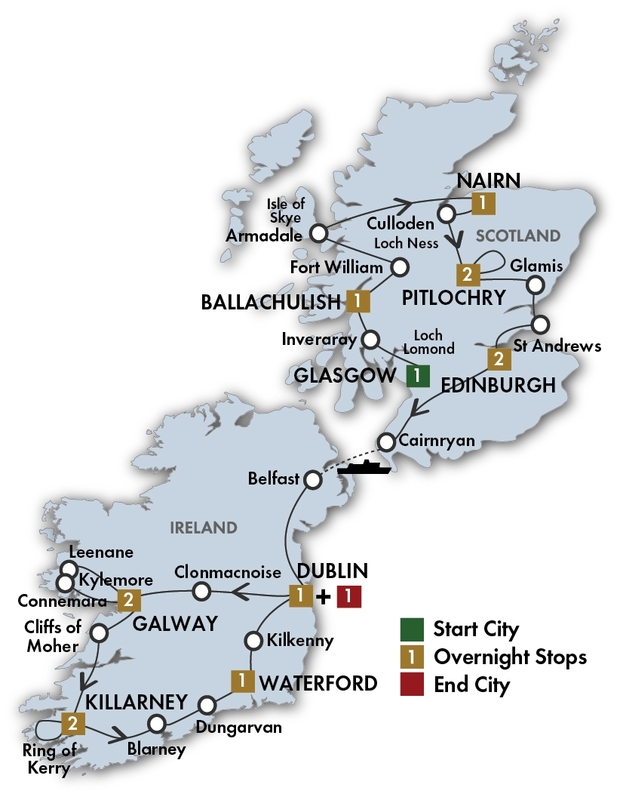 To find your ideal vacation, browse our comprehensive selection of guided coach tours to Scotland and Ireland that vary in length from 10 - 24 days. Choose value-for-money first class programs, splurge with deluxe properties or find something in between. 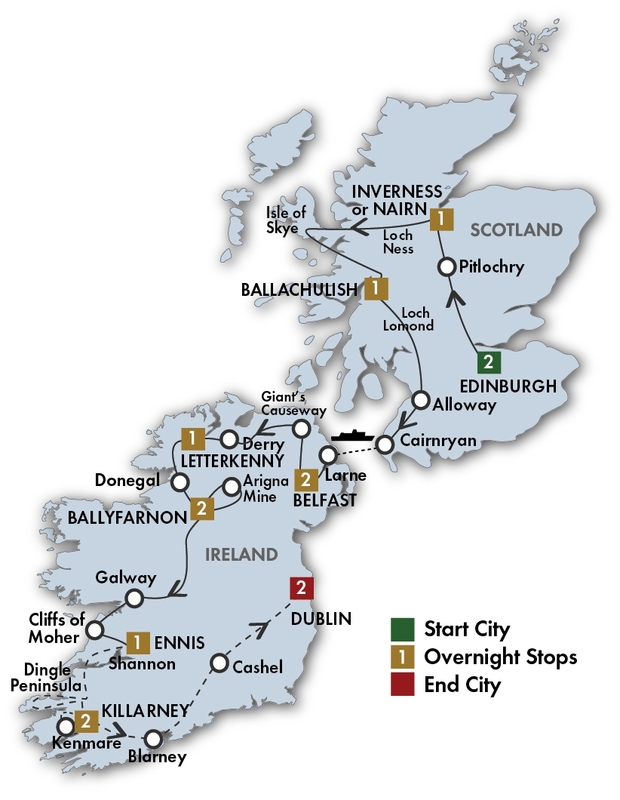 All of our quality escorted coach tours to Ireland & Scotland feature prepaid daily sightseeing, excellent hotels, full breakfasts, most dinners, including specialty dinners with entertainment and, most importantly, no hidden extras! Our tour guides do not sell any optional tours so that they can focus 100% on your vacation enjoyment! 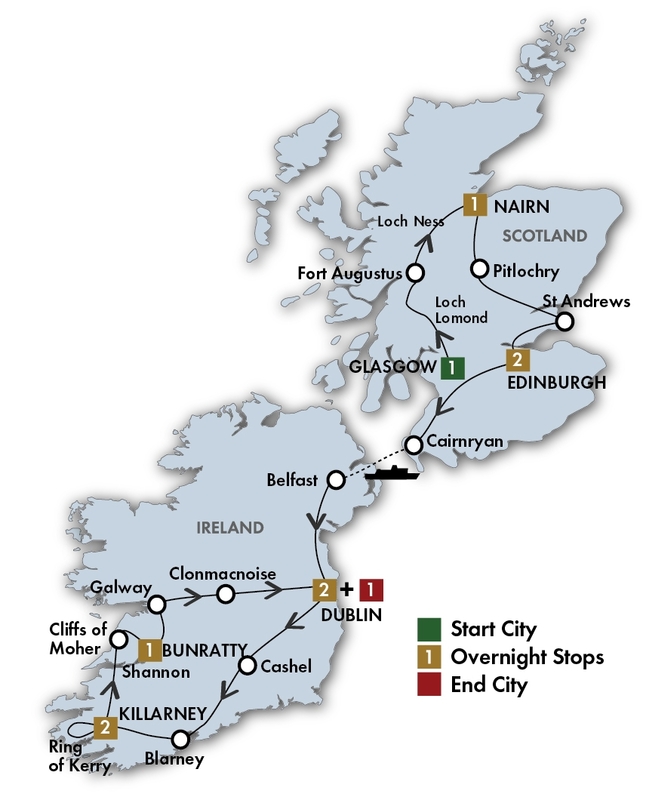 Also consider one of our popular vacations combining Ireland and Scotland with England and Wales. If you need help in deciding which tour is right for you, just call us at 1-800-243-8687 to discuss with one of our friendly CIE Tours travel advisors. Please browse our wide selection of Ireland and Scotland tours below. If you only have a week to spend on vacation, this tour packs in plenty of scenery, historic places and exciting experiences. Start in Dublin before heading to medieval Derry, Giant’s Causeway and Titanic Belfast. A short ferry crossing lands you in Scotland to stay at the Atholl Palace Hotel. Sample whisky before visiting St Andrews and Edinburgh. Explore Scots Irish history on this itinerary when you start in Edinburgh, head into the Highlands and drive through the Isle of Skye. 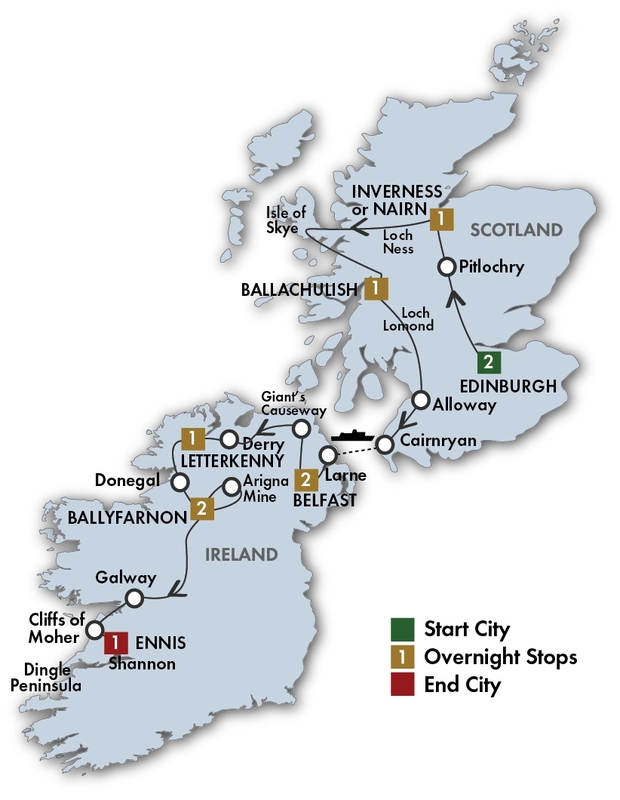 Take a ferry to Ireland to discover Belfast and Derry and stay in Kilronan Castle Hotel. Discover local history and fun stories on walking tours in many storied towns. The longer tour stays in Killarney and ends in Dublin. This great combination tour covers essential parts of Scotland with dreamy castles, mythical Isle of Skye, historic Culloden, skilled sheepdogs and the capital city of Edinburgh. Your adventure continues across the Irish Sea in vibrant Dublin. Visit Blarney Castle, Ring of Kerry, Cliffs of Moher plus three special evenings of dinner/shows.